Our DIY cubicles make office setup a breeze. Save time and money with our easy-to-use workstations. Our slide-together Hush Panel Configurable Cubicles are an easy and affordable workstation solution. Unlike standard office cubicles, which require big budgets, big teams, and lots of time, our Hush Panels are a breeze to set up. Simply slide each post and panel together to create a truly configurable workstation solution. One or two people can easily put together several workstations in just minutes! 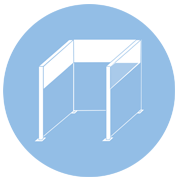 The Hush Panel DIY Cubicles allows you to grow and expand your arrangements as your business grows. 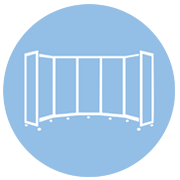 It's easy to build upon your configuration by simply adding more posts and panels. The DIY nature of these cubicle partitions allows the Hush Panel system to tackle any office space, regardless of size or shape. Open offices are a breeze to set up, and with over twenty fabric colors, these workstations will integrate seamlessly. 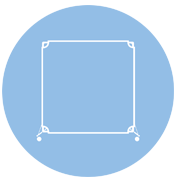 Our Work Station Screens are windowed privacy screens that allow quick creation of portable or temporary workstations. 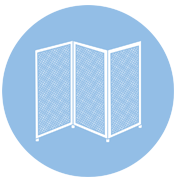 Available in 1, 2, or 3-panel configurations, these privacy panels are lightweight and easy to set up. The acoustical fabric provides some sound-dampening, while the built-in acrylic window allows some visibility while maintaining employee privacy. Create effortless cubicles, workstations, or testing areas. Startups and coworking spaces often utilize former industrial buildings or warehouses for open offices, which provides a sense of community but presents an acoustical and space control challenge. Large spaces can often be tough to work with, but the configurable nature of our slide-together cubicles, allows any shape to be created, while the sound-dampening acoustical fabric will help eliminate excess echo. Enhance office privacy with our Work Forts desktop privacy panels. These tabletop privacy screens provide visual and acoustical privacy, while adding visual flair to any cubicle or desk. Improve employee focus and concentration affordably, or create testing stations on any tabletop. 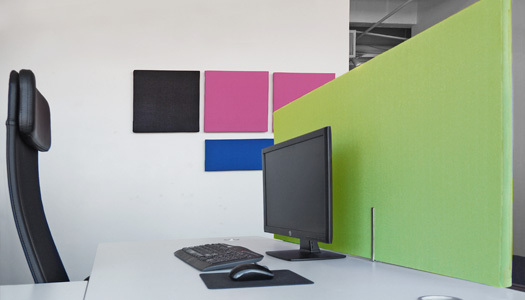 Also be sure to check out our Sound Stones (Wall) acoustic panels for enhanced acoustical control in your office space.